It is important to keep track of the important files and data, moreover it is important to keep it handy without having a second thought of losing it due to some computer crash or device falling or breaking. We have compiled a list of best and free cloud storage service providers. These cloud storage providers give free online storage space from 1 GB to 10 GB; almost all of the listed cloud storage providers have the provision of sharing and collaboration; they have desktop applications as well to sync your computer folders and files quickly. Google Drive is a free cloud storage service by Google which helps you in storing photos, documents, sheets, presentations, mails and attachments. When you signup you get 15 GB of free storage space, this space is calculated on the basis of Gmail, Google Plus Photos and the documents in your Google Drive. The documents created by using Google Drive do not count to the storage data limit. The cloud storage in Google Drive is counted by the messages and attachments, photos in Google Plus Photos which have 2048x2048 pixels or more and the videos which are longer than 15 minutes. Files on your Google Drive can be easily downloaded. Google Drive also has a Windows application to make it easier for you to reach your files easily. Microsoft OneDrive is an online backup service that supports free cloud storage offering 15 GB of free space. To earn yourself additional storage space backup your phone's camera roll to get extra 3 GB or refer OneDrive to friends and get 500MB as bonus storage. To access OneDrive you will have to sign up for hotmail or outlook account. Microsoft OneDrive has desktop application for Windows to access your free cloud storage on your computer. You can upload a file of up to 10 GB size. Dropbox is one of the best cloud storage service providers; you can backup your files to it easily from your desktop or by visiting the website and logging in. It supports a wide range of file formats for uploading and storing. These supported files include code format files like css, php, less, java, scss, sql, markdown, coffee, rb, py, etc. ; image formats like jpg, png, psd, bmp, gif, etc. ; video files like 3gp, mp4, m4v, avi, mov, flv, etc., and document files like doc, docx, ppt, etc. It helps in keeping an online backup of your important files. 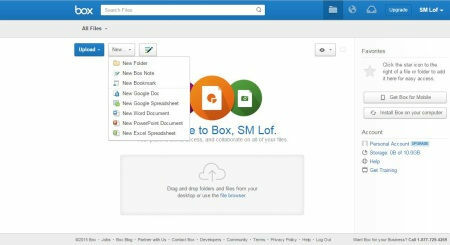 Dropbox is available as free software on Windows. The files uploaded to Dropbox through the desktop software or with mobile app do not have any file size limit but the files uploaded using the upload button of the website has a limit of 10 GB. Initially you get 2 GB of free space in your Dropbox account; you can increase it by either upgrading to PRO version or by referring it to your friends. SpiderOak is one of the best cloud storage service providers. It gives 2 GB free cloud storage to its initial users, you can always sign up or upgrade to personal or business cloud storage accounts to get more free storage. There is no file size limit and it supports all file formats to upload. You can create password encrypted rooms, folders and files with Spideroak. 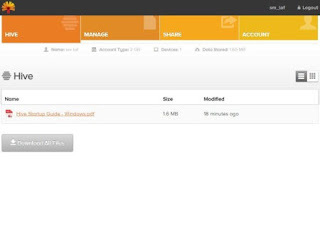 There is desktop application for Spideroak for faster access to your cloud storage. To access SpiderOak web application using your web browser, you will have to sign up for Spideroak, verify email and download the desktop application, log in to it and set up a device for it then log in back to web application of SpiderOak cloud storage. Box is a free online storage service to provide users with personal and business solutions of storing their files on the cloud. In personal account you get 10 GB storage with file upload limit of 250 MB. It is enabled for easy mobile access and desktop sync. Box enables cloud backup of your important files. It also gives you easy and free file sharing options, so you can share your content with people and get their comments right on the content shared. There are paid upgrades available for higher cloud storage and higher file size limit. MEGA is one of the most powerful, best and free cloud storage providers giving its users to start their account at zero cost with 50 GB cloud storage. MEGA is cross platform, cross device and cross browser cloud storage provider. You have access to your files from all your devices or browsers. With free 50 GB cloud storage MEGA gives you freedom to seamlessly sync all your files. MEGA will be providing MEGA chat, email, calling and video conferencing. If you forget your password you lose access to your data, thus it is mandatory to remember your password and to keep a backup of master key provided by MEGA in your cloud storage account. Seacloud is another good cloud storage service provider which gives users free cloud storage of 1 GB. 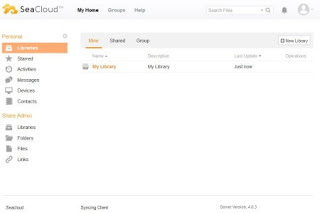 You can share uploaded files and folders with your friends or team members. Password encrypts file or folder on Seacloud cloud storage. It is multi-platform cloud storage web application; it has desktop clients, Smartphone apps and browser login. You can transfer full ownership of libraries on Seacloud drive. You can add contacts and manage them as well. You can even send personal messages to anyone in your contact. iCloud is not only a cloud storage based on web but it is multi-platform data syncing service by Apple. SEamlessly work around on your documents, mails and photos. In iCloud Drive, you can upload your Pages, txt, word, csv, excel files, Numbers, Keynotes and powerpoint files. Compared to the web version of iCloud, the desktop application can help you with contacts, mail, calendars and documents. Each Apple id or iCloud account is given 5 GB of free cloud storage. Amazon Cloud Drive is less known yet best cloud storage web application developed by Amazon Inc. On sign up you get free storage of 5 GB for documents, photos, videos, music and much more. It uploads files quickly and easily. There is a separate tab for photos and videos in Amazon Cloud Drive. You can also access your uploaded files and folders without any problem from your desktop using the Amazon Cloud Drive desktop application. Everything saved on your online drive storage will be synced to the Amazon Cloud Drive application automatically. 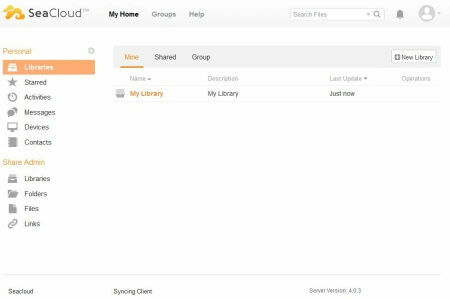 FilesAnywhere is an online backup and online storage free web application that enables its users to not only just backup their files from their device but also share them and collaborate with friends or teammates to work on them together. FilesAnywhere has an additional feature of creating eforms, these forms can be anything and people can be invited to complete them. There are many other features included in Filesanywhere which include sending fax, esend, create FileReceive link, etc. It only gives you 1 GB free cloud storage space. Cloud storage innovation has come to make day-to-day business and software developers much safer and easier. Cloud Computing allows the storage of all company information or even personal information, as well as systems and software, in the cloud, ie the internet.